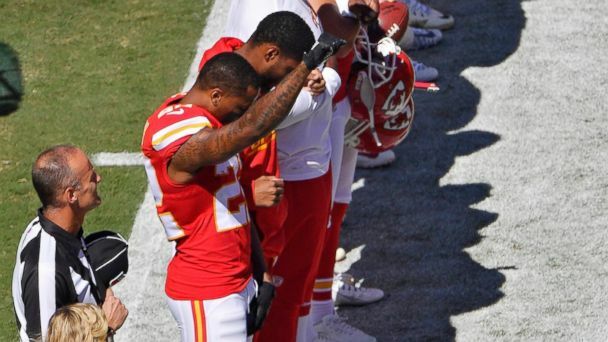 On Sunday, Kansas City Chiefs cornerback Marcus Peters raised his fist, four Miami Dolphins players knelt, and teams interlocked arms as a sign of unity. Each protest came during the playing of the national anthem at the start of their teams' games, adding to a wave of demonstrations set off during the preseason by San Francisco 49ers' quarterback Colin Kaepernick. Peters - who is black and told the press Friday that he salutes Kaepernick for his protests, calling it "a great cause" - raised his fist in protest at the start of a home game against the San Diego Chargers Sunday. As he did, many of his teammates locked arms in an apparent show of solidarity. Meanwhile in Seattle, Miami Dolphins' players Arian Foster, Michael Thomas, Jelani Jenkins and Kenny Stills knelt during the national anthem at the start of their game against the Seahawks. Across the field, Seahawks team members interlocked their arms in a gesture that they had announced earlier would be a "demonstration of unity." Other individual players, including Seahawks' cornerback Jeremy Lane, San Francisco 49ers' safety Eric Reid, and Denver Broncos' linebacker Brandon Marshall have at times also followed Kaepernick's lead in kneeling during the anthem. Kaepernick who refused to stand for the national anthem during preseason games in protest over what he has referred to as America's treatment of "black people and people of color." He has drawn considerable attention for his stance on racial issues and his remarks about the police, sparking a debate among fans and many public officials over the right to protest and the appropriate response to the national anthem. "He spoke up about something he felt he needed to speak up about," Peters said of Kapernick. "I salute him for that. I'm going to back him up." Peters' gesture of raising his fist appears to add a new element of political symbolism to the growing wave of demonstrations in the league. Tommie Smith and John Carlos, gold and bronze medalists in the 200-meter run at the 1968 Olympic Games, engaged in a protest on the victory stand in which they raised their fists in what is frequently described as a "Black Power salute." Peters' actions appear to reference that moment, which became a lasting symbol of America's civil rights movement. As for Kaepernick, the 49ers are scheduled to host the Los Angeles Rams in a game on Monday, Sept. 12. Forty-niners coach Chip Kelly announced that the controversial star player would serve as the team's backup quarterback at that game. He is expected to continue to protest there and will likely receive considerable media attention when he does.